View details on the DL50/K Domestic Audio-Frequency Induction Loop Amplifier Kit below or download the specification sheet. 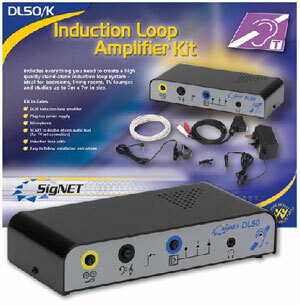 SigNET's new DL50/K domestic loop amplifier kit includes everything you need to create a high quality stand-alone induction loop system for a bedroom, living room, TV lounge or study. Carefully designed to sit discreetly alongside all types of audiovisual equipment, the amplifier features one set of phono inputs (for direct connection to television sets, etc), two microphone inputs and an alert input (for connection to fire alarms, doorbells, etc). Screwdriver-adjustable drive, level, mix and tone controls are provided, allowing the system to be tailored to suit the exact requirements of any room, with installation further aided by the provision of a headphone socket, output current meter, input peak LED and an easy-to-follow installation guide.